Wintertime fun growing up in Maine back in the 1950’s and 60’s included a game called “King of the Mountain” often played on a mound of snow pushed back from the road by snow plows. The idea was simple. A youngster stands on top of a 5-10 foot pile of snow while challengers attack and try to knock ‘em off and take their place. 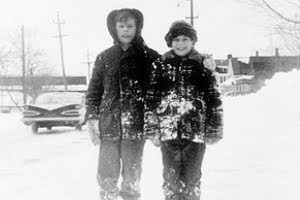 Shown here is my younger brother and I enjoying an accumulation of snow at the end of our driveway in Derby, Maine around 1961. In King of the Mountain the challenge can be one on one, or the champion may have half a dozen kids trying to knock them off the mountain. The danger of falling in the way of traffic was little to none. There was no traffic. That’s an advantage of being a country boy playing King of the Mountain in a small town in rural Maine.